Bedford Town ended the season on Saturday afternoon, drawing 2-2 against Northwood at the Eyrie. Eagles favourite Tom Liversedge was in the wars inside the first minute after clashing with Northwood keeper Berkley Laurencin as both players went for the ball. The Bedford striker suffered a small cut to the back of his head, returning to the pitch after treatment to stem the blood. It was a lively game, and there plenty of chances at either end, with Northwood taking the lead on 21 minutes when a low corner from the right was dummied by Omar Vassell, giving Michael Murray enough time to pick his spot with a sweet right foot shot into the bottom right hand corner of the Bedford net. Niko Muir forced a fine save from Eagles keeper Garry Malone soon afterwards, and from the resulting corner, Ollie Wilkinson cleared Steve Brown’s header off the line. After soaking up the pressure, Bedford hit back on 39 minutes with the equaliser. Greg Ling pushed the ball forward for Jordan Davis to run onto, and the midfielder didn’t disappoint as he slotted the ball past Laurencin. Northwood regained the lead on 62 minutes, however, as Ismael Ehui put Rob Hastings through to lob the ball over Malone. 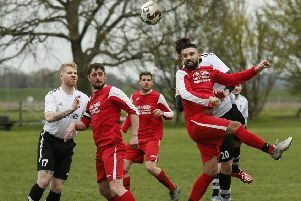 Bedford equalised eight minutes later, and it was fitting that the goal came off the boot of top scorer Liversedge who made no mistake in claiming his 18th goal of the season, as he smashed the ball home to ensure Bedford ended the Division One Central season in 17th position. For the second season running, fans’ favourite Paul Cooper won the supporters’ player of the season. Rob Parker was voted by his team-mates for the player’s player of the season, and the managers’ player of the season went to the consistent Josh McGoldrick.